This meditation on the twelve Improperia, or Reproaches – a ceremony of the Good Friday Liturgy - was made by Prof. Plinio in one talk. TIA has broken it into three parts to make it easier for our readers to follow. This is Part II. Information about what the Reproaches are as well as advice regarding the spiritual advantages for us in meditating on them can be found in the introduction of Part I (click here). What more ought I to do for you that I have not done? And with a spear you have pierced the side of your Savior. This reproach is directed to the Jewish people. God planted the Chosen People in the Promised Land as a vineyard of great excellence. God did not plant a common vineyard, He chose to cultivate one of great quality. This vineyard was meant to turn out sweet grapes and a superior wine, but instead it produced bitter fruit, bitter far beyond all imagination. "For in My thirst you gave Me vinegar..."
He gives two examples. When He was thirsty, they did not give Him good wine or even simple water to drink; instead they gave Him vinegar. When He was dead and hanging from the Cross, instead of receiving some consolation from His children, they sent a man to pierce the side of their Savior. That lance pierced the Heart of Our Lord, the symbol of His love for them, and the last drop of blood flowed from His Sacred Body. That is, the cruelty reached its apex. This was the ingratitude of the Jewish people. This reproach is made not just to the Jews, but also to us. How should we understand it? Each of us is a special vineyard that Our Lord planted in the most precious terrain of the Catholic Church. After the See of St. Peter, the place I love most is the baptismal font by means of which I entered the Catholic Church. There I received the most precious grace of my life, which is to be planted by Our Lord in the vineyard of the Catholic Church. This is much more than to enter the Promised Land. The Church is the motherland of my soul. Given this great benefit, I should have produced the sweetest of fruit, I should have followed His Commandments, I should have loved and completely obeyed Him. I should never have strayed from Him even for a minute. But my life was not like this. I did things that offended Him, I sinned. I became a bitter grape that poorly repays the care of the One who solicitously planted it .Worse than that: when Our Lord needed my help, when He needed the pure, limpid water of honest reparation, I was lukewarm and indifferent. I gave Him vinegar to drink. After He died for me, I sinned. I was ungrateful for His love. My sin pierced His Heart with the coldness of my egoism and the hardness of my impenitence. I became the spear of the soldier piercing the Heart of the Redeemer. 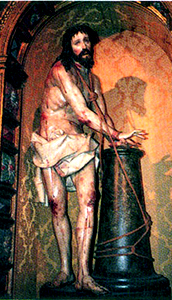 I drew the last drop of Blood from His Sacred Body. 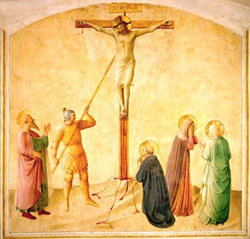 Tradition tells us that Longinus, the Roman soldier who lunged the spear into the Heart of Our Lord, was nearly blind. 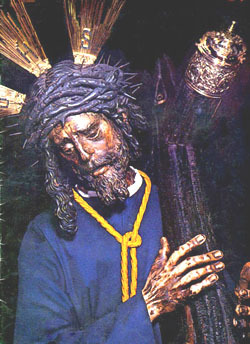 After he thrust his spear into the Heart of Christ, some of the water and blood that flowed from it fell onto his face and touched his eyes. He was cured immediately of his blindness and converted as a consequence. He became a saint, and throughout his life St. Longinus repented for that act. Just as He forgave the cruelty and cured the blindness of Longinus, we should ask Our Lord to also forgive our hardness, coldness, blindness, and ingratitude and give us the grace to repent and be saints to properly love and serve Him. My people, what have I done to you? How have I offended you? Answer me. When the Jews were in Egypt, God send a plague to convince the Pharaoh to release the Jewish people. God killed all the first-born sons of Egypt. It was a scourge that chastised the most important and richest nation of the time. It was the greatest miracle that God had ordered the Angels to work through Moses, and it was also the decisive one, because after that the Pharaoh let the Jewish people go free. "And you have delivered Me to be scourged..."
It is interesting to see how God considers this chastisement that He made on one people as a mercy for His people. According to today’s erroneous and sentimental notion of God, He would never send a chastisement to anyone because this would be “against Divine Goodness.” This is not what the Catholic Church teaches in these Reproaches of the Passion. God was infinitely good when He punished the Egyptians, so much so that He presents this example as one of the poignant landmarks of His love for His people. It is useful, in passing, to see how Liberalism is corrupting our minds. God was extremely merciful in liberating His Chosen People and allowing them to go free in order to fulfill their mission, which was to prepare themselves for the coming of the Messiah. But when Our Lord came, instead of receiving Him as they were meant to do, they delivered Him to be scourged by the Romans. 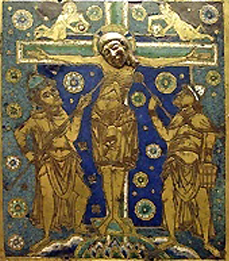 It is a poignant contradiction: God scourged the most powerful people of the time, the Egyptians, to free the Jews; the Jews imprisoned Our Lord and delivered Him to the Romans, the most powerful people of their time, to be scourged. How many times does our human respect and servile fear of public opinion lead us to compromise on Catholic principles? How many times have we set aside and laughed at Catholic customs in order to fit in with the revolutionary world? How many times have we attacked traditional practices of Christendom in order to follow the fashion of the moment? Each time we did one of these things we were whipping Our Lord; we were lacerating His pure flesh; we were causing His Divine Blood to spill on the ground, we were ridiculing His Royalty as Lord of the Universe. We should be convinced of our cowardice, repent, and ask Our Lady to give us strength and courage to affirm our Catholic principles before the world. And you have delivered Me to the chief priests. The Pharaoh was considered the symbol of the Devil, because he was the highest earthly power of the time and wanted to destroy the Chosen People who bore in them the seed of the promise, the Messiah. The Jews were liberated by God from the Pharaoh, who persecuted them. God drowned the Egyptians in the Red Sea. Instead of being grateful for that and for the Redemption that Our Lord would shortly bring to all mankind, the Jews delivered Our Lord to the high priests to be killed. That is, both the high priests and the Chosen People were acting as partisans of the Devil. The people had been symbolically liberated from the Devil by the Pharaoh’s drowning in the Red Sea, just as they would be delivered in fact when Our Lord would drown the power of the Devil by His Redemption. "My people, what have I done to you? How have I offended you? Answer me"
It is another poignant contradiction and example of ingratitude. It also has an application for us today. How many times, in our desire to please bad priests, did we forget to follow God? How many times did we follow their progressivist theories and relaxed morals without the least analysis just because they were priests? How often have we spoken against and even slandered good Catholics who represent the cause of Our Lord Jesus Christ in order to please this or that ecclesiastic who hates those good Catholics? How many times have we blindly obeyed bad priests rather than Our Lord? On one hand, we should always remember that priests are other Christs and Bishops are the Princes of the Church, Successors of the Apostles. As such, they deserve the highest respect and obedience. On the other hand, we cannot forget that many times in History they were the leaders of heresies and moral compromises who led the faithful to the worst consequences. The example of the high priests of the Synagogue plotting the death of Our Lord is there to teach us this. Therefore, it is not enough for us to follow ecclesiastics no matter what they are or teach; it is necessary to discern who does not deserve to be followed. Otherwise, we will be delivering our souls to death, and we will be delivering Our Lord to another Crucifixion. Inspired by this reproach we should ask Our Lady to give us all possible respect for the Clergy and Hierarchy, but also to give us a cogent vigilance and a strong determination to not follow their errors, should they exist. The comments made in the third reproach can be applied also to this one. God led the Jewish people in the desert as a pillar of clouds during the day and a pillar of light at night. That is, He never left them without orientation; they always knew where to go to carry out the will of God. The ingratitude of the Jews was flagrant when they led their Messiah to the Pretorium to be judged by Pilate, a man who had no knowledge of the truth. He was absolutely incapable of judging anyone, much less Truth itself, the Word Incarnate. This has an application to our lives. God gave us Revelation and its secure interpretation by the traditional Magisterium of the Catholic Church. It is a column of clouds during the day, the normal life of Catholics, and a column of light at night, the times of crisis when it is difficult to distinguish truth and error. It is always there to show us what the flawless truth is and the right path to follow in order to carry out the will of God. How many times have I denied this clear and constant teaching of Holy Mother Church? How many times have I adhered to modernist and progressivist novelties moved by laziness in reacting against the mainstream? Was I not leading Our Lord – the Catholic Faith – to be judged by Pilate – people who have no notion of what the truth is? 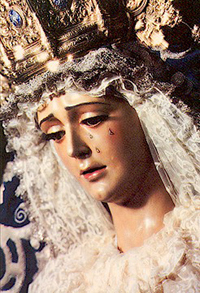 We should ask Our Lady of Sorrows, who followed the steps of the Passion in an exemplary way, to increase our love for truth and give us fidelity to the traditional Magisterium of the Church, no matter who is against it. Even if the highest judges on earth would condemn this Magisterium, we should continue to follow it, as Our Lady followed Our Lord to the very end.